I really think internet is a magic that allows you find many many interesting things including some funky tools. 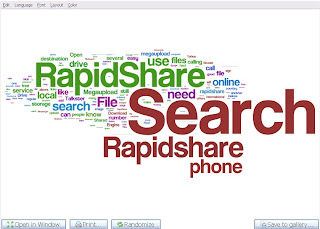 Wordle is a kind of tool that allows you make a beautiful text clouds. It is not a live text cloud for your website but it still pretty. You can use this tool to create your own text clouds in two ways: one is you can type your words into the table, another one is type your website's address or an Atom or RSS feed. After that, it will load a java platform that gives you some options to choose font, color, layout. It is a magic but only for a picture that you can save it on server or print, it is not a live clouds widget for your site. Just for fun.